We flew with KLM from IAD (Washington-Dulles airport in the US) to OTP (Otopeni-Bucharest airport in Romania) during this past New Year’s Eve and Day. I highly recommend KLM, we’ve had the best flying experience with them of all the airlines we’ve used so far. I should warn you that Delta handles the ticketing and check-in for KLM at American airports — this means rude and borderline-incompetent service. At least that was our experience at Dulles Airport in DC. KLM can’t help it I suppose. At least once you step onto their planes, it’s a different world altogether. It’s clean, well-lit, well-ventilated, they’re friendly, accommodating, their in-flight video service is amazing, and their food is great. How is KLM different from other airlines? Well, they’re not evil, like United Airlines, and they’re not clueless, like Alitalia, and they’re not mean, like Spirit. We picked New Year’s for our flight out of Washington because we thought most people would stay at home. We were wrong. The flight to Amsterdam was fully booked. Who flies on New Years Eve anyway?! Apparently, young people, Muslims and Indians. I understand the latter two groups, because they don’t celebrate New Year’s on the same day as the Western world, but since when have young folks decided to give up partying on New Year’s Eve? 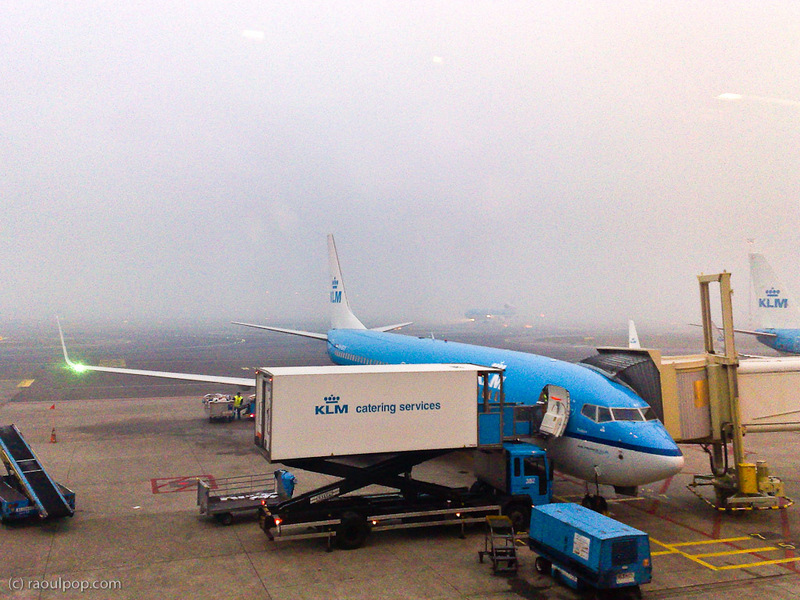 It was a foggy, somewhat snowy New Year’s morning when we arrived in Amsterdam. 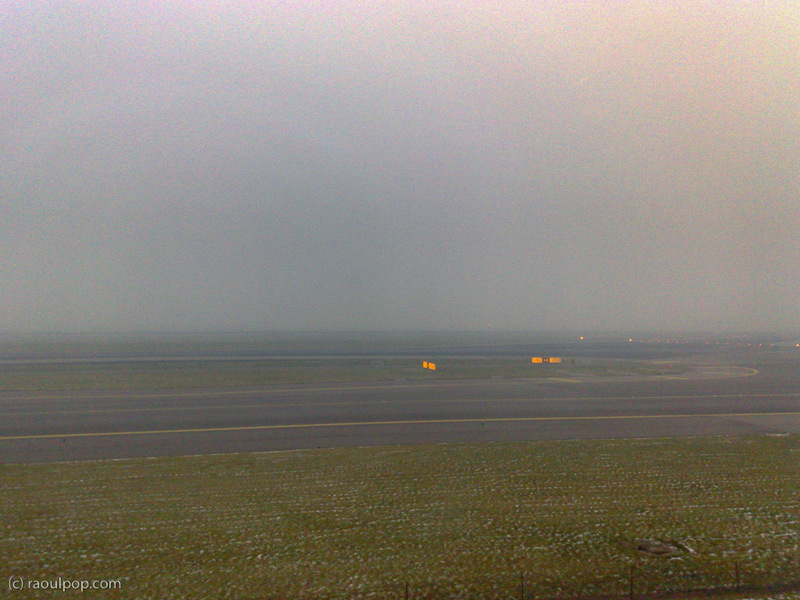 You couldn’t see a thing on the runway as the plane landed. Thank goodness the pilots knew what they were doing. By the time we cleared through customs and security, the fog cleared a bit as well, or at least as much as the photos show. The flight from Amsterdam to Bucharest was empty, which figures. Most Romanians stay home on New Year’s. They prefer to have their traditional parties, then start the new year with some time off. I think there were at most 12 people on the entire plane. I felt bad for KLM, having to fly that big jet with so few people on board, but I suppose things average out in the long run. Oh, and yes, KLM did wish us a Happy New Year while we were over the Atlantic Ocean, and gave us a choice of champagne or orange juice to toast in the new year. Quite nice of them! Why don’t I have any photos from the Bucharest airport? Because photography still isn’t allowed there, which is dumb, but then that’s par for the course in Romania.